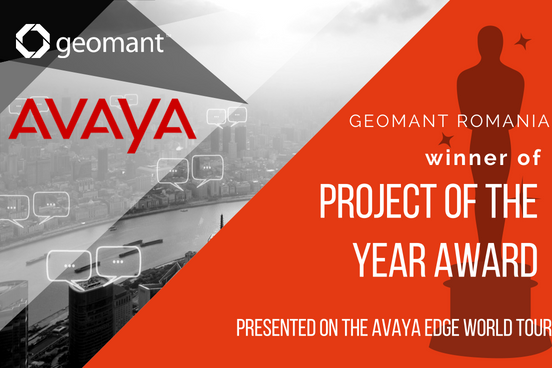 Geomant wins Avaya "Project of the Year Award"
Geomant as a system integrator proved to be a reliable and trustworthy partner. Throughout the cooperation we received quality services and we appreciate the flexibility of solution offered. Geomant is working responsibly and tries to meet the needs of our innovative technological solutions. The quality of services and the flexibility of the solution offered differentiates the company from its competitors favorably. The Award was presented on the Avaya Edge World Tour hosted in Zagreb on 28th of March 2018 as a recognition for the implementation of an omni-channel contact centre based on Avaya Elite Multichannel (EMC) and Avaya Aura for Autonet Import Romania, a regional leader in the automotive car parts and services industry. The Avaya Elite Multichannel is a multi-purpose customer service solution. It provides a reliable, integrated, affordable multichannel contact centre solution and rich and compelling customer experiences. It is designed for midsize to large firms who are seeking ways to achieve operational efficiency, increase revenue and improve customer satisfaction and retention. Autonet decided to implement Avaya for their contact centre as a result of a long and detailed analysis of the contact centre solution market. With the close of the implementation we have moved into the operational support phase, where Geomant again works closely with Autonet in helping reach their business goals: increase sales year after year and maintain an excellent customer experience through their contact centre. Geomant Romania is a long-term business partner and services partner of Avaya in Romania. We have invested and continue to invest in Avaya partnership by keeping our engineers informed and trained on latest products from Avaya and market trends in the Contact Centre industry.